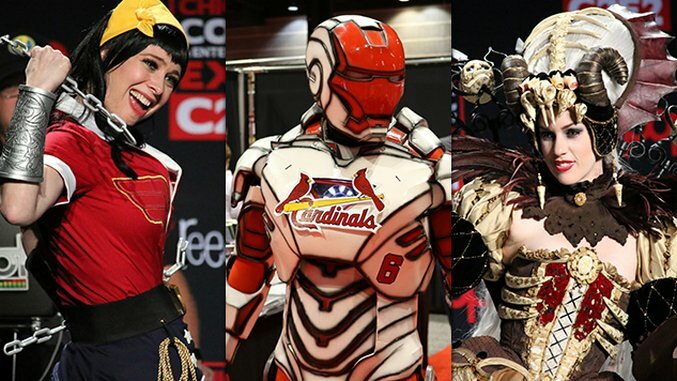 Chicago’s C2E2 (Chicago Comic and Entertainment Expo) may not have the clout of Comic-Con or NYCC in terms of drawing the biggest pop culture stars—after all, this was only its seventh year of existence—but it has made a name for itself as a cosplay hub. This year, its Crown Championship of Cosplay, one of the most prestigious competitions of its kind, featured competitors from four continents decked out in mind-blowing, elaborate getups, including those of the Iron Man Hulkbuster, a World of Warcraft Orc and a Ford Mustang Transformer. The winner ended up being an Australian woman named Major Sam who dressed as Julietta Necromancer, a character created by Japanese artist Sakizo. That said, C2E2 also played host to hundreds, if not thousands, of amateur cosplayers. We’ve collected a bunch of photos of these enthusiastic attendees for your perusal. Among our favorite trends was seeing people dressed as Deadpool dressed as someone else—Finn the Human, Link, Batman—because Deadpool would totally cosplay at a comic con.